Zscaler is a global, carrier—grade Internet security platform used by more than 5,000 enterprises, governments and military organizations. Much like Amazon Web Services, Salesforce.com, Office 365 or Google Apps, Zscaler is a massive, global cloud computing-based security and compliance system built into the fabric of the Internet. To deploy Zscaler, you simply set up your security and compliance policies in our web-based graphical administrative console and then route your Internet-bound traffic to our systems. Zscaler then bi-directionally inspects every byte of your Internet traffic, blocks malware and cyber-attacks, prevents intellectual property leakage and enforces your business policies. You can think of our system like a massively-distributed series of checkpoints in the cloud—point your Internet traffic to us, and we will inspect every byte, ensure the content is safe and compliant, forward approved traffic to its eventual destination and then log the actions that we took. As such, we act like a security and compliance filter in the path of all of your Internet traffic – whether it is destined for consumer websites like Facebook, Google or Baidu, commercial cloud applications like Salesforce.com and Box, public cloud services like Amazon Web Services or Microsoft Windows Azure, or your own private cloud applications, perhaps running at IBM, HP or Verizon data centers. We also inspect the Internet traffic generated by mobile applications. 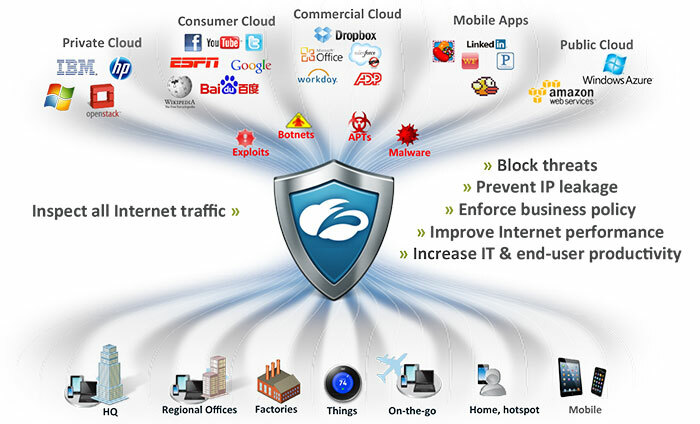 Zscaler is designed to protect all of your users and all of your systems, wherever on the planet they happen to be located – including your road warriors, mobile users, guest Wifi users, and even your smart devices and Internet-connected “things.” All you need to do is ensure that outbound Internet traffic for those locations, people or devices that you wish to protect is directed through the Zscaler cloud security platform on its way to the Internet. We protect all of your Internet-connected devices, including desktops, laptops, tablets, Macs, PCs, mobile devices, smart phones, things and much more – and we protect them however they happen to be connected to the Internet - whether they are connected through your own corporate network infrastructure, through local and home Internet connections, through mobile hotspots at hotels and coffee shops, or even via 3G and 4G cellular connections.